Fish oil supplements which contain omega-3 fatty acids are thought to be beneficial for people at risk of heart disease or diabetes (metabolic syndrome) by potentially improving adipose (fat) tissue function. 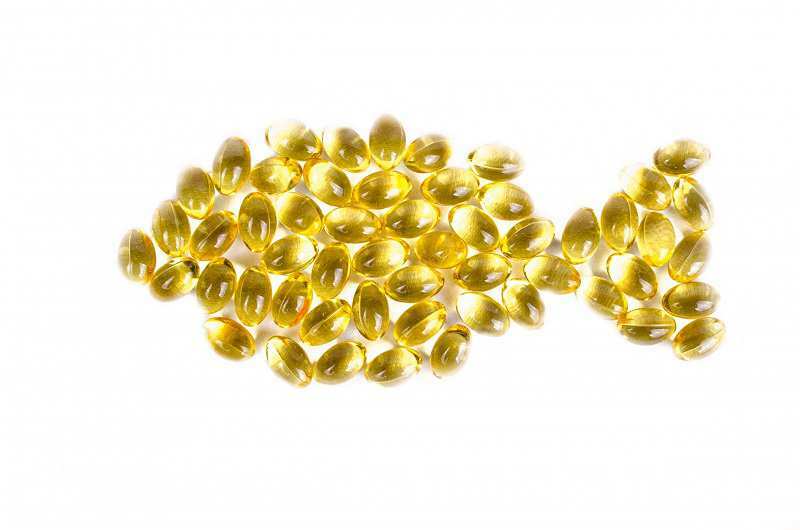 However, after six months of a high dose of omega-3 fatty acids supplementation in patients who were overweight, obese and insulin-resistant, no beneficial effects were observed. Metabolic syndrome, or systemic insulin resistance, occurs when several conditions such as excess body fat, abnormal cholesterol and triglyceride levels (fat stores your body can use for energy), high blood sugar, increased blood pressure leads to an increase in the risk of heart disease, stroke and diabetes. It has been hypothesized that a potential underlying cause of this disorder is due to inflammation of fatty tissue and poor regulation of insulin-mediated suppression of lipolysis, the process of breaking down fat into free fatty acids used for energy. The failure of insulin to inhibit lipolysis can result in insulin resistance due to the elevation of free fatty acids, a known contributor to this disorder. A study published in The American Journal of Clinical Nutrition by Jensen and colleagues investigated whether a high dose of very-long-chain omega-3 fatty acids would affect inflammation of adipose tissue and insulin regulation of lipolysis. Insulin promotes the storage of fat in adipose tissue by promoting the conversion of glucose into fat, and inhibits the secretion of hormones such as glucagon which regulate lipolysis, thus effectively preventing the breakdown of fatty tissue. A double-blind, placebo-controlled randomized study (study and laboratory staff did not know which patients were given the treatment and which were given placebo until trial completion) was carried out in insulin-resistant adults who were not currently taking any medication or supplements and did not have any additional conditions which could affect the study outcome. Also, all volunteers maintained a stable weight and did not engage in exercise longer than 30 minutes more than two days a week. They were instructed to not alter their dietary of physical activity habits during their participation in the study. One group of 12 adults was given high levels of omega-3 fatty acid supplementation over a period of six months and the other group of 9 adults was given a placebo. Before and after treatment, all volunteers underwent adipose tissue biopsies to determine whether there were any changes in inflammation of the tissue. Researchers measured the levels of macrophages (white blood cells crucial in the immune system and found at sites of inflammation) and performed 2-step pancreatic clamping to measure insulin regulation of glucose metabolism and plasma insulin, glucose and free fatty acid concentrations. The results showed that while there was a significant increase in omega-3 fatty acids in the plasma and adipose tissue of the treatment group, there was no change in adipose tissue inflammation or insulin-mediated suppression of lipolysis. Therefore, the results did not support the hypothesis that omega-3 fish oil tablets are beneficial for people at risk of diabetes. However, the effect of omega-3 fatty acid supplements on features of metabolic syndrome may vary depending on the severity of the disease. Those who participated in this study had only 1-2 conditions associated with metabolic syndrome, whereas those with more than 3 or with type 2 diabetes have been reported to show improvements in adipose tissue health and function. To date, due to insufficient evidence from clinical trials, it is unclear which stage of metabolic syndrome may benefit from omega-3 supplementation with fish oil tablets.